Calligraphy markets have begun sales 10 days before Tet (Lunar New Year), the traditional time for opening of the markets. “As a decade-long Vietnamese tradition, I’ll visit the markets to look for calligraphy works in hope of bringing happiness, success, wealth and health to my family,” said Tran Minh Anh, a garment worker in Tan Phu district. Two traditional calligraphy markets in HCM City are located at the Youth Cultural House and the Labour Cultural House in District 1, attracting more than 50 calligraphers who are members of calligraphy clubs in the city and neighbouring provinces. The artists, dressed in Ao dai, including men and women of varying ages, are showing their skills and selling calligraphy in black and yellow ink on red paper at the venue. 18-year-old calligrapher Vo Xuan Thanh of HCM City said it was the fifth time that he had participated in the calligraphy market at the Youth Cultural House. Each calligraphy work is priced from VND30,000 - 200,000 ($1.3 - 8.8), depending on the craftsmanship, size and materials. 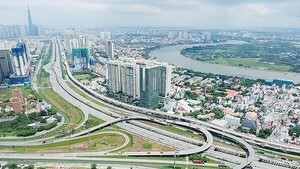 Large works are VND400,000 ($17.6 )or more. The calligraphers are taking requests from visitors for words to write on red lucky money envelopes as well. The envelopes cost from 30,000 VND for a set of five. Most visitors prefer buying lucky money envelopes and small calligraphy pictures to hang on mai (ochna) trees, according to Thanh. This year, the market has offered products in leather like wallets and handbags. They are painted with images of landscapes, flowers, mascots and pets, priced from VND 50,000 VND ($2.2). Apart from looking for calligraphy works, several residents and foreigners visit the markets for beautiful, colourful photos. The market is decorated with apricot and peach blossom trees, while the calligraphers sitting on mats are arranged in an oval shape symbolising peace, similar to the calligraphy markets in the past. 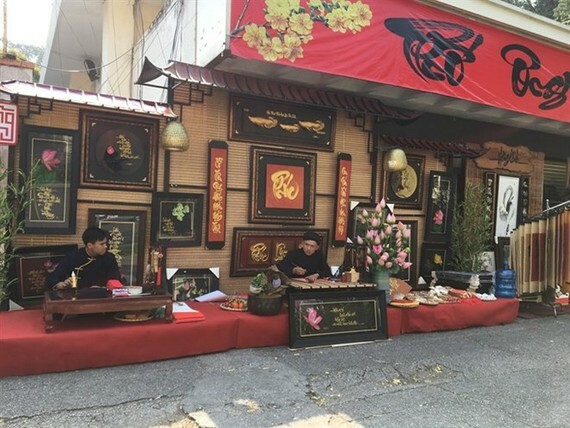 The calligraphy market is one of the cultural traits during Tet in HCM City, along with the Tao Dan Flower Festival and Nguyen Hue Flower Street. Both markets at the Youth Cultural House and the Labour Cultural House will remain open until February 15 (Lunar New Year’s Eve).